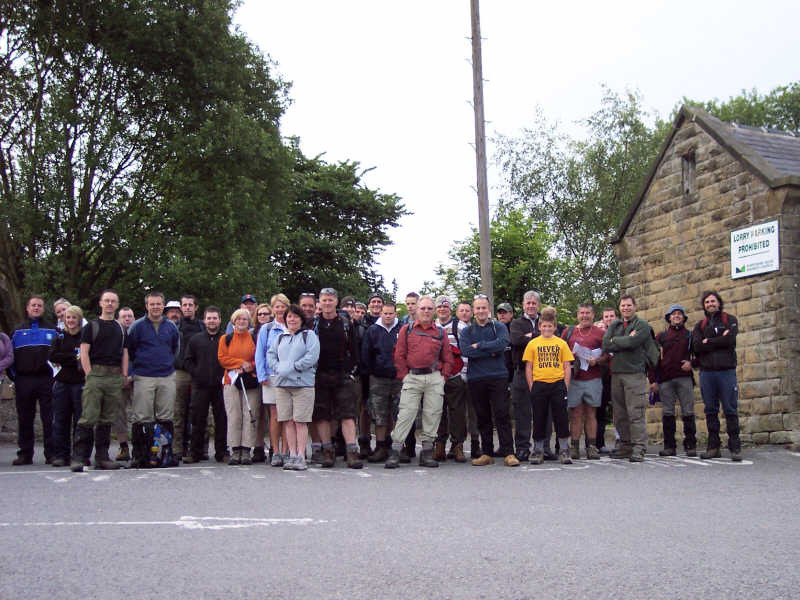 Once again the annual Three Peaks Challenge fundraising event was taken ‘on tour’ to the Chatsworth area of Derbyshire where our sponsored walk was broken into the now familiar twin distance circular course. 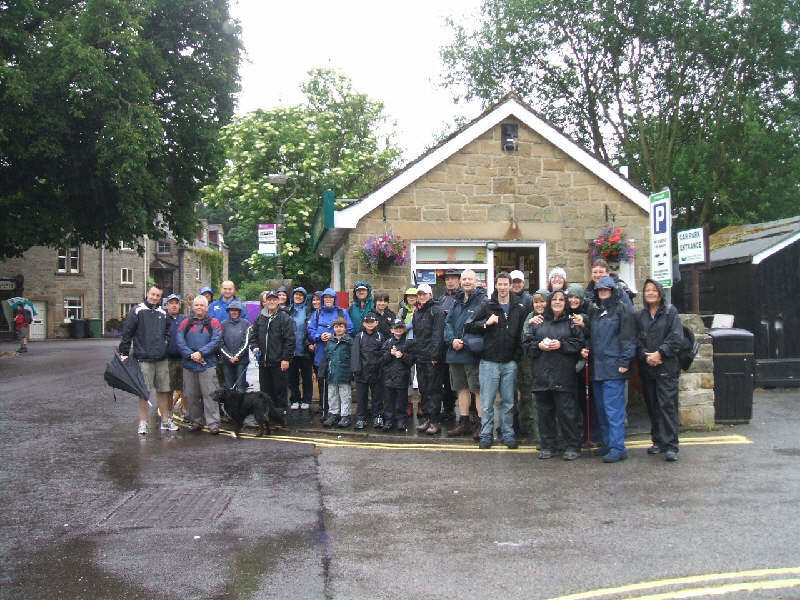 A 22 mile course for the fit and healthy, which set off at 06:00 hours in the morning, and a less demanding 8 mile walk which set off some hours later, and which is arranged so that the respective walkers arrive at the finishing point at approximately the same time. 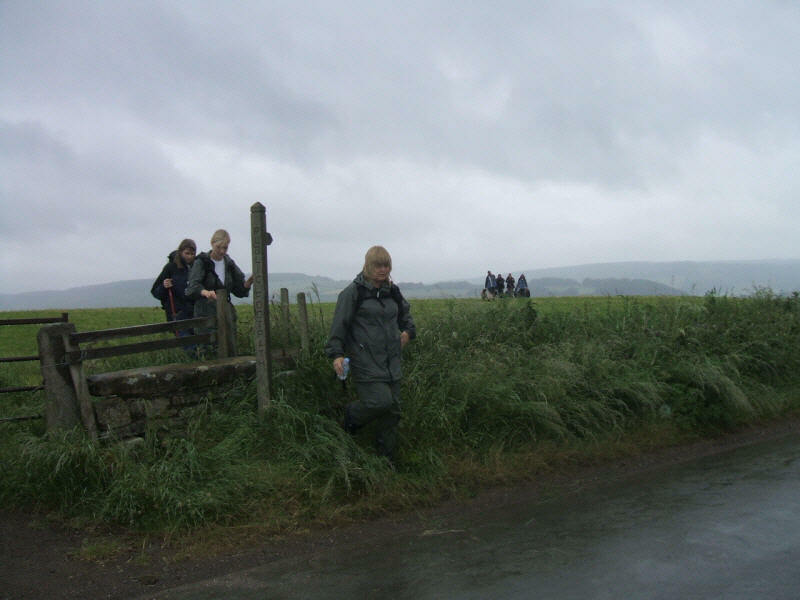 After the miserable weather of 2007 we hoped for better conditions. 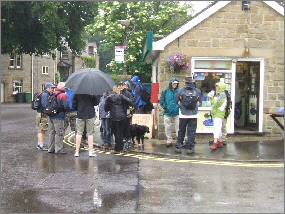 Unfortunately, as we see from the eight mile walkers just before their start it was more and more rain. proudly displays her Certificate of Completion. Also to be seen in the plastic wallet is her memento of the day’s efforts. This year it was in the form of an engraved pen. Those of you who know Ann well will know she usually sports a broad grin on her face, but to keep it up after a kamikaze pheasant has buried itself up to it’s neck in the side of your head must really take some doing. 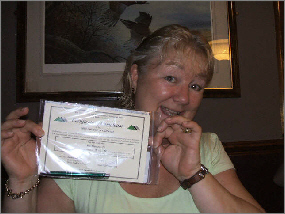 Well done Ann! 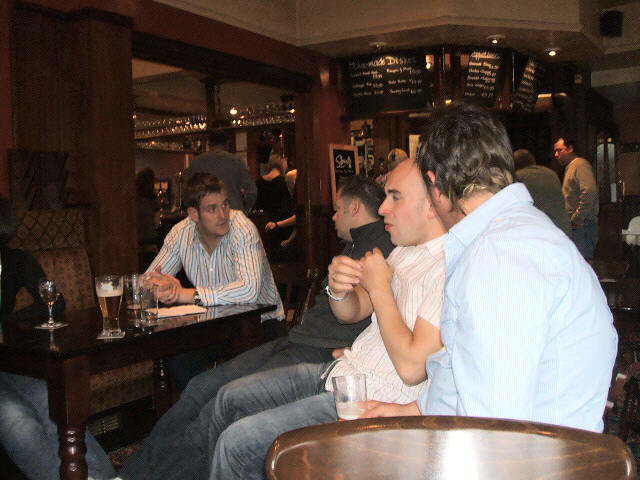 Here we have a group of the 22 mile pacesetters who are already back enjoying a beer in the Fox & Hounds in Batley (I think I was just about making it through Edensor at this time). 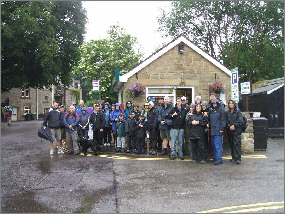 Over the years the Fox & Hounds has become the ‘Official’ pub of the Three Peaks/Chatsworth Challenge. 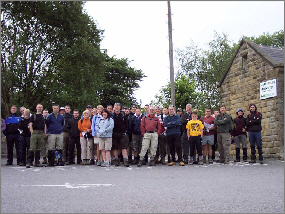 This is mainly due to the fact that, along with serving an excellent range of beers and lagers, the bulk of the walk’s participants come from the Heavy Woollen District of Yorkshire, which happens to centre on Batley. 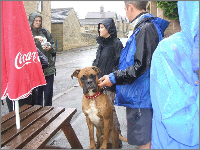 Rachel Hardy, the pub landlady, not only took part in the 8 mile walk but also managed to get back in time to rustle up some excellent hot beef sandwiches. Thanks for that Rachel, they were just what the doctor ordered. (plus Vanessa’s purple arm) on this time delayed photo I think I’ve managed to cut five people out of history, one of them being me. (it’s not easy when you’re working under pressure you know). I’m told Bob Johnson missed the shoot due to him being in the toilets sorting the final finishes to his poncho. At 13 Joe Hitch in the yellow tee shirt is again the youngest entrant in the 22 mile walk, and once again returned an excellent time of 7 hours:40 minutes for the 22 mile distance. 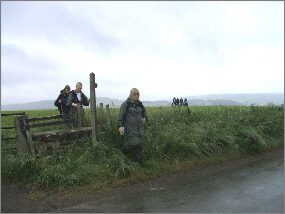 Almost halfway round is the first checkpoint in the small village of Monyash. 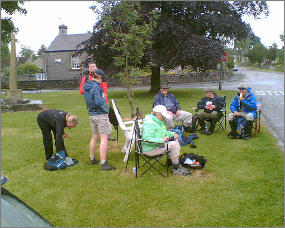 Here we find the Roof-Pro contingent, led as usual by David Gatehouse (in the bushman’s titfer), enjoying a bit of R&R on the village green prior to setting off on the home leg. From the healthy eating in evidence it’s hard to believe that just out of camera shot is the village café doing a roaring trade in tea, coffee and bacon sandwiches. 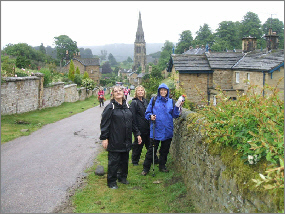 The next few miles from Monyash are some of the best of the walk as it follows the river through Lathkill Dale right to the outskirts of Bakewell. 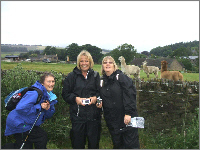 determined team leader, Stella Mitchell in the black rain-gear has to be held back by a grinning Janine and Katie in case she set off a false start. Despite the weather Mark Spittle’s legs are braving the elements, though I’m led to believe he did need to hide under his umbrella for the full 8 miles. starting to become extended, and by the end of the walk there was probably an hour between the first and last finishers. I could handle a bit of this 8 mile walking malarkey myself if this is what goes on. 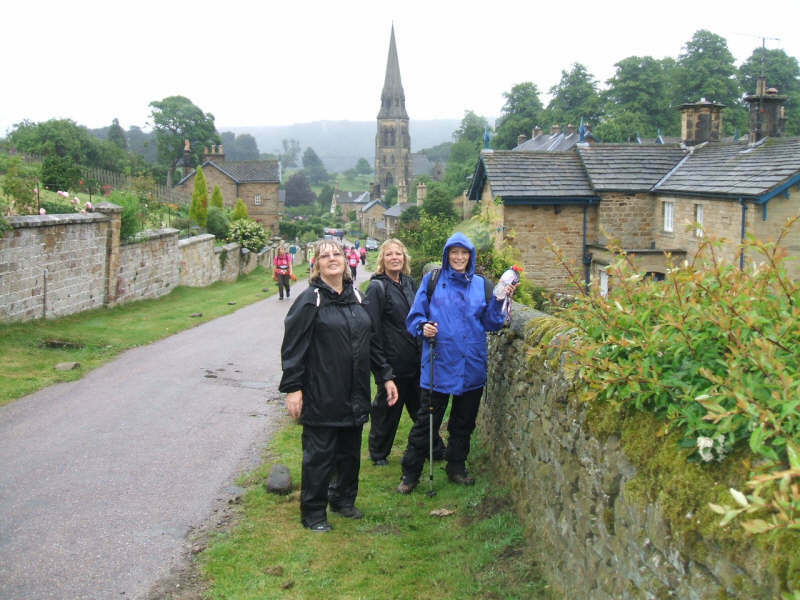 5 miles into the walk and they’re already on their second pub stop at the Devonshire Arms in Pilsey after previously enjoying the hospitality of the Eyre Arms at Hassop. 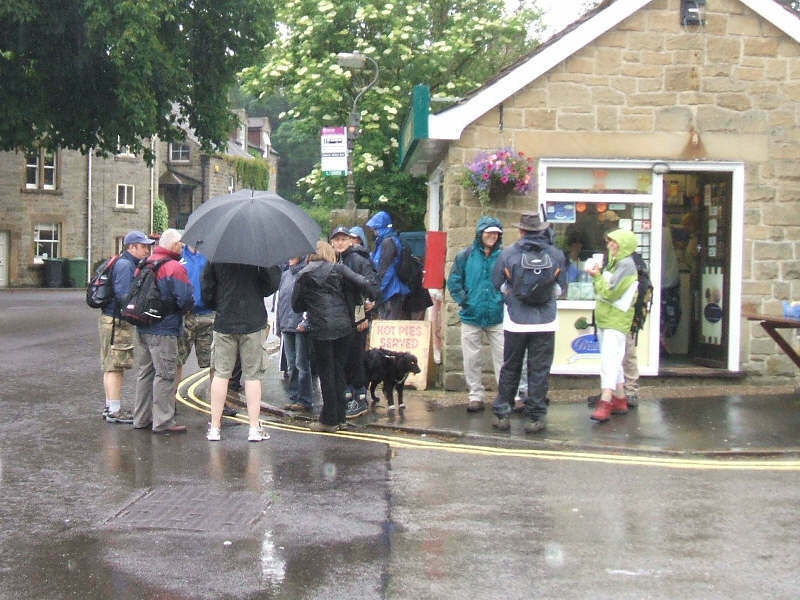 The numbers here are a little bit low due to most of the walkers being in the snug. 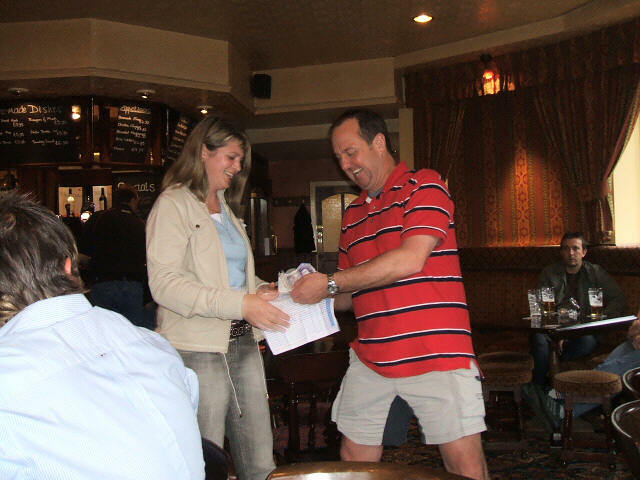 The word on the streets has it that Kev Dyson was leading a sing-song by the piano while this photo was being taken! 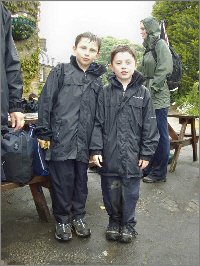 At ages of 9 and 7 respectively, brothers Tom (left) and George Harrison (right) are the youngest walkers to date to take part in our event. 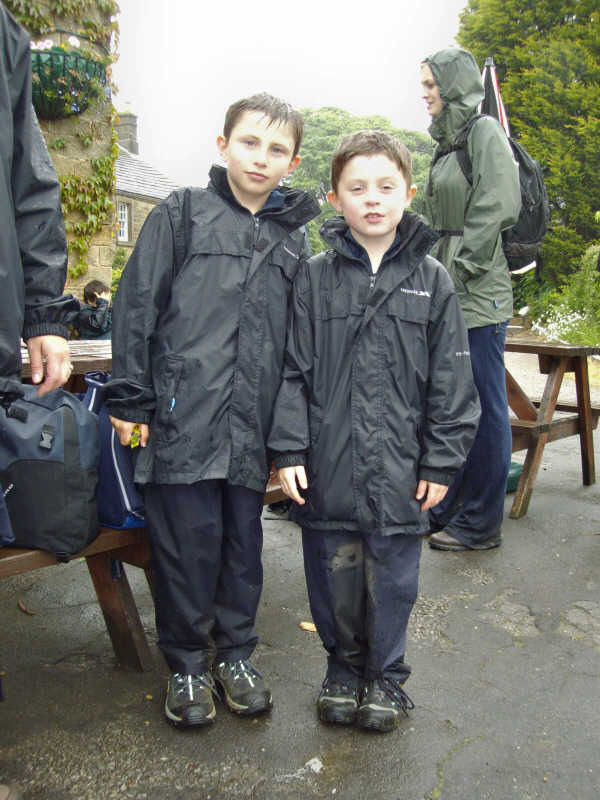 They are both well kitted out against the weather and I’m led to believe that despite a bit of belly-aching whilst climbing the steep wooded track up to Pilsey they thoroughly enjoyed their day. Enough to do it all again in 2009 though perhaps?? They also weighed in quite nicely with their sponsorship too. Well done lads ! Three charming creatures keeping a safe distance on their side of the dry stone wall, well away from their placid looking but highly temper-amental and occasionally ferocious neighbours on the other side. They can be easily offended and become unruly and sometimes violent if annoyed, and are also known to occasionally spit and kick when angry. 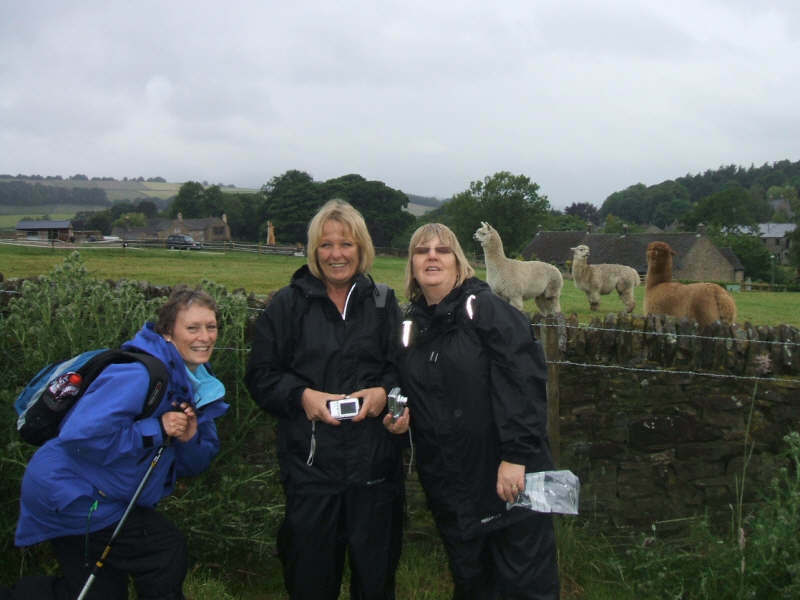 The llamas can be dangerous too. (or Alpacas )! (Yes., I know it’s obvious, and boring old Music Hall patter, and you can see it coming a mile off, but once I’d seen the photo I just couldn’t resist). (PL). 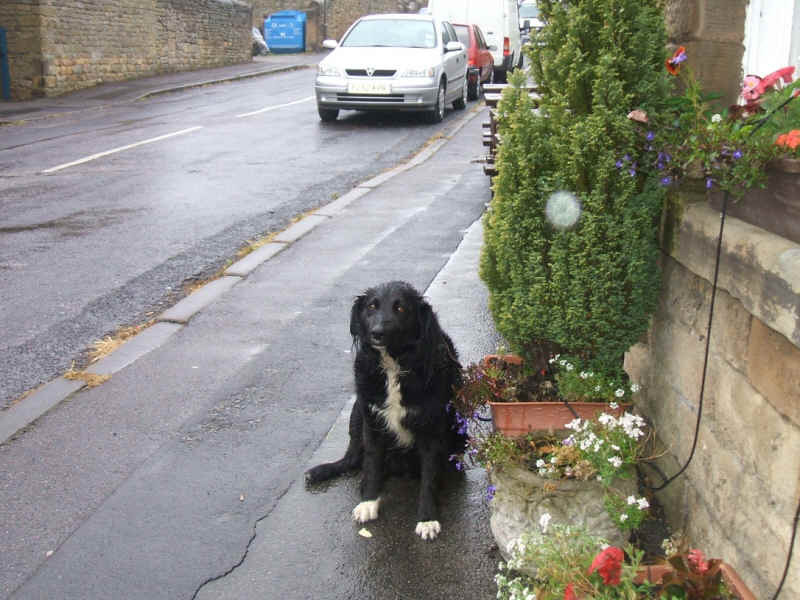 To prove just how wet and miserable it really was... Nigel Healeas’s dog Poppy shows just how to look truly wet and miserable ! 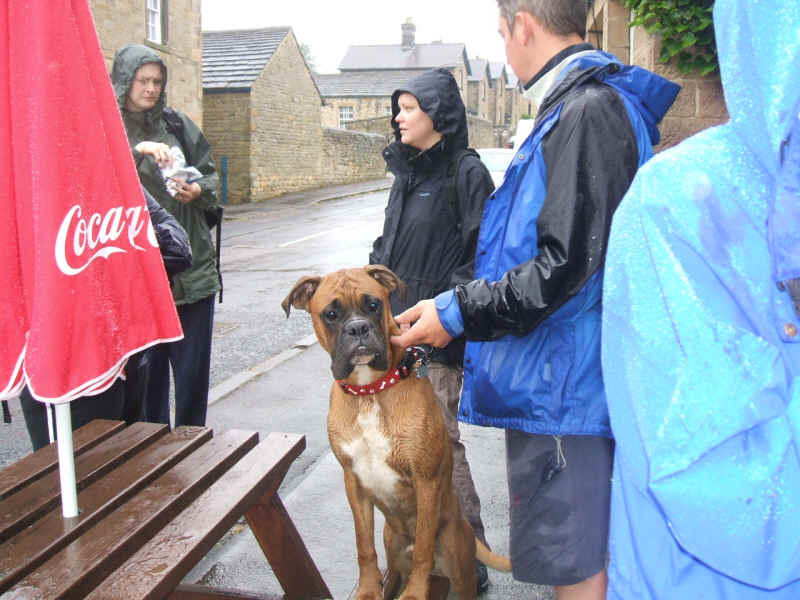 Walter the pub dog at our ‘home base’, the Fox and Hounds in Batley however is a little less concerned about the conditions.